I haven’t been blogging much lately, but that’s because I’ve been busy experimenting with my beers. I’ve brewed 6 batches of beer, plus started my own yeast bank and played around with sour beer program a bit. I did a lot of research for my sour beer program. I started in this back in August with my first Flanders Red and Lambic, but I’ve added two more reds, a Berliner Weisse, Oud Bruin, and a Sour Farmhouse Ale that used a split primary fermentation to give the lacto a headstart. In addition to the sours I have made a Robust Porter and a Schwarzbier and kept all the different strains used in the yeast (and bug) bank. The most recent Flanders Red batches were brewed as a single batch and the recipe was based on the one in Brewing Classic Styles by Jamil Zainasheff. It was brewed as a full batch and fermented for in the primary with Wyeast 1056, but then split between two secondary fermenters with the larger part getting the Wyeast Rosaelare blend and the other part getting the Wyeast De Bom. They’re now aging with a bit of oak in the fermenters. The Berliner Weisse was done as a no boil/no hop batch. Michael Tonesmeire talks about this in his book, American Sour Beers. I asked him about the hops, which his recipe show being added in the decoction part of the mash and he suggested that the IBU levels were so low that your could forgo them, so I did. I also didn’t do a decoction mash, just a single infusion. 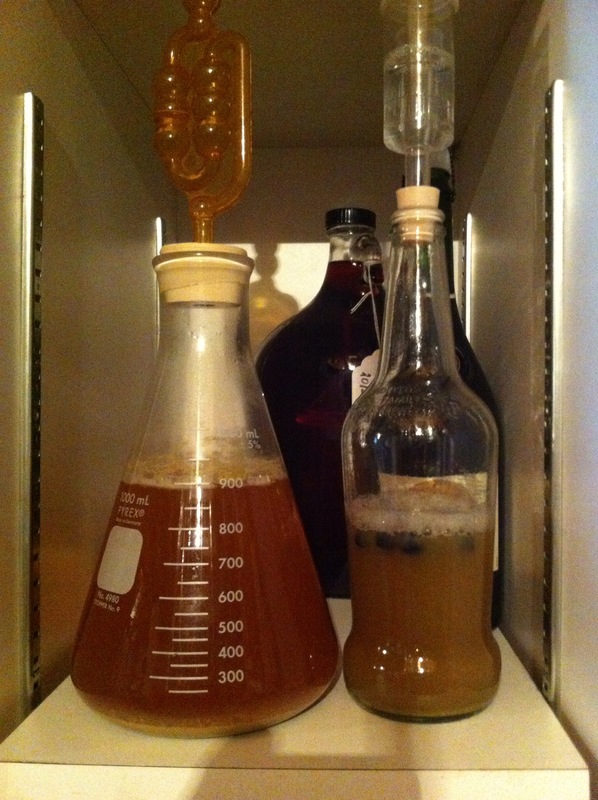 Lacto, half pack of Brett L., and a clean ale yeast (house culture of Wyeast 1056) added. The main fermentation went well and its now resting and hopefully getting delicious. The Sour Farmhouse Ale is the one I’m looking forward to the most. I dream of kicking back in the heat of summer with a few bottles of this. This was originally split in two and had lacto in one half and WPL566 Belgian Saison II in the other. The lacto part was kept warm (pitched at about 100 F) on a heating pad and after a couple of days when both were going full on they got combined and had a third of a pack of Brett Brux. added. The ferment took off and is quite vigorous as I’m typing. I will slowly warm this a bit as it starts to finish to make sure it drys out good. My Oud Bruin was fermented out for a week with the same house culture of Wyeast 1056 as the Berliner Weisse (large starter split between the two) and half a pack of Brett L. Then racked onto about 500mL of the lacto half of the Sour Farmhouse Ale and then had Pedio and a half pack of Brett Brux. Hope to try this in the summer and maybe drink it in the fall or winter. We’ll see how it comes along. My Flanders Red from last August has a nice profile, but was a bit lacklustre in both the complexity and the sourness. It is sitting at SG 1.006, which says to me that it’s probably pretty much done the ferment, so I’m guessing the sourness is pretty locked it, and the one-dimensional level of complexity is probably more-or-less set as well. So, I think that this can use some new fermentable and judging by the flavour I’m thinking cherries and probably some fresh bugs to chew on them. Its 6 months on and another 6+ months with cherries should build up the complexity I’m looking for. The Lambic tastes good. I was a bit afraid with this one because it was brewed and just had the Wyeast Lambic Blend added, capped off with and airlock, and left untouched. I had no idea what to expect, and I was please it didn’t taste like vomit. It actually tastes like a traditional lambic, more or less. It’s young and some more age will help, but it’s right in the ballpark already. I am happy with this one so far. But, because I fell like experimenting, I think that half of the batch will get put onto raspberries and aged another 6+ months. The SG is 1.002 and if thats going to hold steady I will bottle up some to drink this summer (I’m thinking I will leave some to age longer for later blending). I must admit, I’m having fun with this sour program, but it takes forever (it seems) and I’m really looking forward to drinking these beers. Look for more updates and it moves along. Follow up to the original post about my Axe Grinder Pale Ale. This was a pretty good brew, but the hops could be bumped up. Click here for the recipe. Axe Grinder: Hoppy pale ale for the coming cool months. As the nights start to cool and I find myself shopping for the little one’s school supplies, I know that summer is ending and fall is closing in on us. Late August is hop season. This is the time of year that the hops on the farms and in the backyards of the very avid home brewer are maturing and are ready to be picked for beer. I don’t have a hop farm or even a rhizome or two in the yard (yet), but I do love hops. The fall, to me, signals the time to brew something hoppy. Though, admittedly, I am not as big of a hophead as some of people (I’m looking to you on the West Coast), but I do love that big hit of hop flavour and aroma. I love a great balance beer with big notes of citrus, pine, and even a bit dank. So, whats left to do, but brew a hoppy pale ale. I worked out a recipe a while back, but never got to brewing it until recently. I was looking for something that was moderate in strength (mid-5% or so) and moderate in bitterness, but big in hop flavour and aroma. I always like to try new things and my local home brew shop started to carry Falconer’s Flight, a blend of Pacific Northwest hops from Hop Union – loads of citrus, tropical fruit, and floral notes, by all accounts – so I thought that would be perfect for a pale ale. Brew day was two weeks ago and went great, no problems or anything. The beer was fermented at 19 C and was finished up in about 10 days. I gave it a couple of extra days and then chilled to 2 C for a day or so before putting it into a keg. Since its fresh in the keg I will give it a few days to get carbonated, but I can say that out of the fermenter it was pretty awesome. The aroma was almost pure grapefruit, so much citrus with just a touch of the grains. The favour was much as the aroma, loads of citrus – grapefruit, lemon, and some tropical hints. With a pretty solid bitterness and just enough of the malt backbone to keep things in check this beer is balanced nicely. I can’t wait to see how it is in a few days, but I think I may have hit on my perfect “house” pale ale recipe after more than a few tries. Stay tuned for some tasting notes in the near future on this one. Click here for those who want to try it check out my recipe for the now named Axe Grinder. 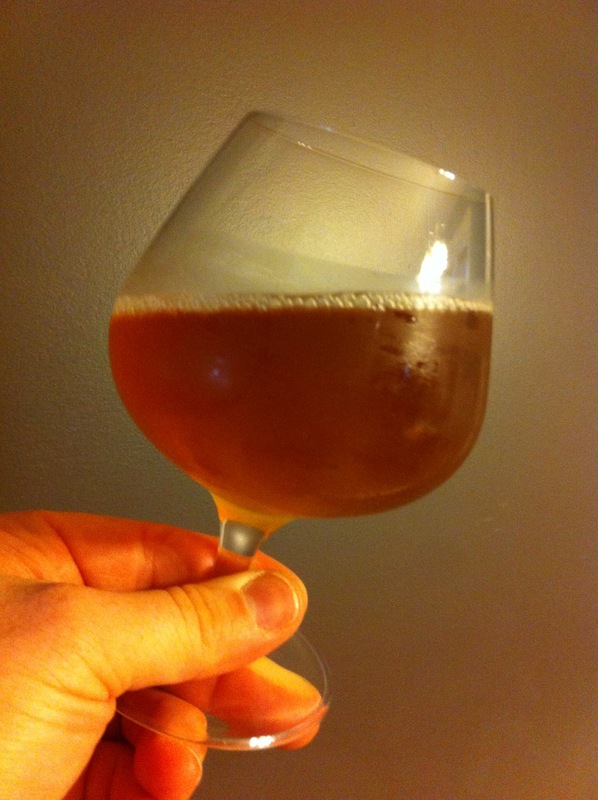 A year-and-a-half ago, in January of 2013, I brewed an English styled Old Ale using a limited release Old Ale Blend from Wyeast – which was a yeast blend that included a culture of brettanomyces. This was my first encounter with brettanomyces, or brett (known as the king of wild yeast). Brett is cousin of saccharomyces, which is what typical brewers yeast is (and the same as bakers yeast, just a different twig in the same branch of the family tree). Both are in the same family of fungus (yes, fungus!) and will ferment sugars into CO2 and, most importantly, alcohol. Most of the time brewers do their best to keep brett out of their beers, avoiding it like the plague for fear of contaminating their “clean” beers. Brett creates flavours that are typically referred to as “funk” and are described from “fruity” to “barnyard” and “horse blanket”. It sounds pretty bad, but is one of the main flavour contributors to Belgian and American styled sour ales, changing flavour over its long maturation period (months to years). It can be manipulated, somewhat, with the conditions set out by the brewer in the wort/beer, temperature, time, and brett strain (like yeast, they’re not all the same). So, why would anyone want to tempt fate and contaminated beers? Flavour, experimentation, to prove you can, sheer insanity – somewhere in there. After my initial brett beer I did nothing more in the way of “mixed” fermentations until recently when I decided that I wanted to go back down that road. (Mixed fermentation is when not just brewers yeast is added, but brett and/or bacteria cultures to sour the beer – my original brett Old Ale, for example, had brewers yeast and brett). I had been reading a lot on The Mad Fermentationist blog about his experiments with brett, as well as, lactobacillus and pediococcus bacterial fermentations as is done in traditional sour beers from Northern Europe and by newer breweries in the US. This sparked that urge in me to try it. I’ve had several sour ales before and love them, and I’m not afraid of trying new experiments (nor am I afraid of contaminating my other, clean beers – basic sanitation and common sense should help). First thing I did was culture up the dregs from my Old Ale using first a small amount (250mL) of unhopped wort in a mason jar covered in tinfoil to see what would happen. After two weeks it was smelling and looking good, pH and gravity had dropped, so I had a taste and it was nice and fruity (cherry-like). Next, I added it to some lightly hopped wort (900mL) and put in an airlock, and this is where it sits as I’m writing, sill fermenting/aging. I hope to use this culture to ferment out an pale ale and added it to some other fermentations. The next bit of experimenting came from inspiration after reading American Sour Beers by Michael Tonsmeire (also the operator/writer of The Mad Fermentationist). I made a small (300mL) lightly hopped wort (13 IBU) and added nothing but 10 or so ripe blueberries from my bush in the backyard. I have no idea what I will grow in this one, but if the test come out (pH, gravity, smell) its probably safe enough to taste and then we’ll see if it was a success (note of caution – attempting to grow something from the wild can be dangerous. There is a possibility of mold or E.coli or other nasty things growing in that wort. There are some indicators that its safe or not, but I’m no expert and I don’t advocate following my word on this). My hope is to capture some local wild yeast and souring bacteria that will make tasty beer. We’ll see how it goes, wait for a future post on this. I have also purchased ingredients for a lambic beer, including Wyeast Lambic Blend, which is a blend of brewers yeast, brett, lactobacillus, and pediococcus. This will be a more traditional attempt at a sour ale. I also plan on a red type ale as a side experiment with the lambic blend, my house cultured brett blend, and a standard ale yeast. I will post on this once they are made. So, as I start out down this long road to sour ales, I feel like I’m part brew master and part mad scientist. I can see the need for more airlocks and jugs of various sizes (and space for them, and understand/tolerance from my wife) in the near future. The path to great beer is always exciting, but now that I’m on this path I feel a new brewer, excited like a kid in a candy shop with cash in his hand. Look for upcoming posts as I brew and experiment. Like us on Facebook, follow us on Twitter and Instagram, and lets be friends on Untappd. Crystal vs. Caramel Malts: Are they so different? Crystal or Caramel malts are listed on nearly every recipe from porter to IPA, bitter to schwarzbier, all-grain and extract (with grains, of course), but why is it sometimes called crystal and sometimes caramel? Is there a difference or are these two words totally interchangeable and just up to the writer? My brew software generalizes them together and so do most websites (including this one), so whats the deal? I’m sure many would just say they are the same in every way, but thats not really the truth. Sure they are similar in usages and share the same colouring levels and similar flavours, but there are real differences. In a nutshell, what are crystal/caramel malts? They’re a grain (typically barley, but might also be wheat, rye, or some other grain) that have been malted and put through a process to covert their starches into sugars, like mashing in the husk. The grain is then roasted/kilned to the desired colour. The resulting malt is ready to use and doesn’t need to be mashed (though it can be) since the starches are already converted. This makes a great grain for steeping when making beer with just extracts. It adds some fermentable sugars to the wort, but it adds a lot of longer chain sugars that help build body and good head retention. They also add some sweetness and flavour, and add colour to the beer. As you can see, this is a pretty useful malt and its no wonder why its in so many recipes. It comes down to history first and process second. Crystal malt first developed in Britain in the lat 19th century, most likely in response to the decrease in the gravity of British, and therefore malt and flavour, of beer that was being produced. These malts allowed for the lower grain bills to still produce a favourable beer. When home brewing was first made legal (again) in the US, there was a flood of these European “crystal” malts into the US, but the domestic maltsters were already producing a similar product but calling it “caramel” malt. 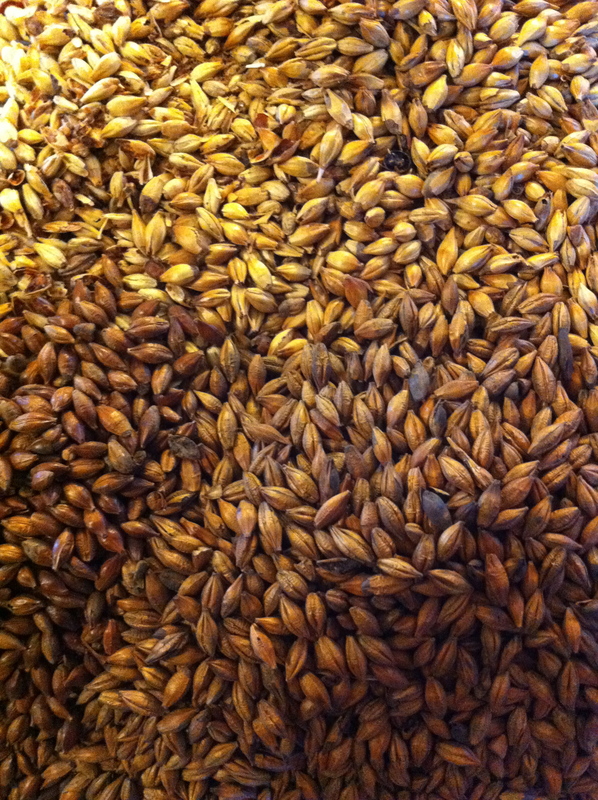 Much of the time it was exactly the same process, making it the same malt, but in some cases it was made differently. For simplicity sake (and to make a distinction), I will call them “crystal” and “caramel” malts, though many times malts these names are used interchangeably by maltsters, causing more confusion. I will use the names to indicate the difference between the process, but you will have to get confirmation form your supplier (if you can) as to what process was used to produce the malt you’re buying. If you can’t get the information about the malt, if you crack a bit of it open and 90+% of the kernels are a glassy, crystallized sugars inside, then its crystal type. If its uneven and a mix of different centres to the malt, its caramel type. The biggest differences between crystal type malts and caramel type malts comes down to the equipment used and the heat of the process. In both cases, the barley (or another grain) is malted and then this “green” malt is steam-cooked in the ‘sacch rest temperature range (60-70 C, 140-158 F) to convert the starches to sugar. The crystal malt name refers to the “crystallization” of the sugars. In this process the malt is “cooked” in a roaster that can, if needed, achieve temperatures in excess of 700 F. The conversion process is quicker in the roaster because it can easily get to temperature while the grains remain moist. Conversion can be complete in under an hour and then the malt is roasted. The grain is heated to the point of “crystallization” of the sugars, called “hard crack”, this is above 300 degrees F (anyone who has made candy will know what this is about). This is a caramelization of the sugars and makes a toffee/caramel taste that varies with the degree to which the malt is roasted. Caramel malts are produced in a kiln and it is not nearly as hot as a roaster. The temperature of a kiln can’t make 300 F to produce the “hard crack” caramelization like a roaster can. This process is similar in that the malt goes in wet, but because of the limitations on the temperature, and the size and shape of the kiln, the malt starts to dry on top before the conversion is complete causing the process to be a lot longer. Also, since it can’t get as hot, to achieve the colour it takes longer, and the way the kiln works means the grains can be unevenly roasted. This longer, cooler process will produce some caramelization, but not to the degree of the roaster. The flavours produced are from Maillard reaction (a chemical reaction with sugars and amino acid: heat + amino acid + sugar = hundreds of flavour compounds and a discussion for another post) that may be similar to caramel flavours that varies with the degree the malt is kilned. So, its two sides to the same coin? Yes and no. Yes, as in it produces malts that are similar in usage and flavours. No, as in the malt produced is chemically different and will have a slightly different flavour (Maillard verse caramelization). Due to the way the colour is formed from one type to the other, a crystal malt with a Lovibond colour of 40 degrees (Crystal 40) and a caramel malt of 40 degrees (Caramel 40) probably won’t taste quite the same, but could be used interchangeably to produce a similar colour and body in a beer. Crystal malt tends to be a cleaner, more pure sweetness, while the caramel malt, though sweet, has a more bready, biscuity flavour. Most of the time it will be crystal types malts that are found on the market. The majority of the European maltsters will be producing the crystal type and a good portion of the North American masters will be the same. It’s not to say one will be better for your beer than the other, but it is to know the differences, know what you want to achieve, and understand how to get there. And always, let your tastebuds lead the way and keep good notes. For more reading on this see Terry Foster’s and Bob Hansen’s article in the November 2013 issue of Brew Your Own magazine or this article from Briess. For many brewers the steps together from grain to glass are a no brained – mash in, conversion rest, mash out, lauter, and sparge. For those who seek to get the highest efficiency possible and ring every last bit of sugar out of the grain, the sparge is pretty important. But what about those who just want to make good beer and don’t really concern themselves with high efficiency, but rather consistent results (yours truly included)? Do we need the sparge? There was a very inspiring article in the November 2011 edition of Brew Your Own about no-sparge brewing. My own personal experiences have fallen pretty much inline with what the article said, and it make sense; the efficiency falls off pretty quick the higher the gravity (above 1.045-1.050), but the beer has a nice round maltiness. Theres seems to be little or no difference on low gravity beers as far as efficiency goes, but it rounds out the flavour and keeps it from seeming too thin. The technique is petty simple – add all the water you will use for brewing (mash and sparge) to the grains and when it’s converted, run it out into the kettle and boil. Couldn’t be easier. This is a pretty thin mash, but it’s forgiving. The one thing to keep in mind is that the mash tun needs to be able to handle the whole volume – this isn’t too much of a problem for low strength brews. You might need a bit more grain to make up for the loss on efficiency, but its a minimal cost. For some comparison, in the days of ol’, most brewers were pretty much doing this already, they’d run out the first lot of wort and make a strong beer, the difference is they’d add more water and do a second (or third) running to make progressively weaker beers. This is known as parti-gyle, with the first gyle resembling a no-sparge type batch. Also, there is a rise in “Brew-in-a-bag” style brewing, where the brew kettle acts as the mash tun and a large mesh bag contains the grains. The whole volume of water is typically used and to lauter, the bag is just lifted out and let to drain. Sounds like no-sparge to me. The greatest thing about home brewing is the ability to experiment. I once heard Michael Dawson say (and I’m quoting from memory), “Whats the worst that will happen? You’ll get some beer”. So, experiment, have fun, enjoy some beer, and share your experiances.